I’m doing a series of interviews with leaders in the field on human germline modification. The first interview in this series was with George Church. Today is the second in this series and is a conversation I had with Dr. Jennifer Doudna, a pioneer in CRISPR-Cas9 technology. 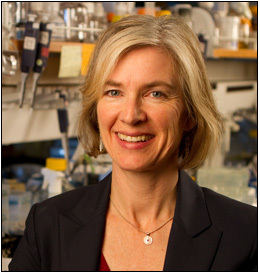 Doudna is a Professor in MCB and Chemistry as well as Li Ka Shing Chancellor’s Chair in Biomedical and Health Sciences at UC Berkeley. She is also an HHMI Investigator. You can read more about the Doudna lab’s research here. She is not only an internationally respected researcher, but also continues to lead efforts to catalyze discussion on the potential future applications of CRISPR-Cas9 technology including dialogue on possible future work in the human germline. An initial meeting was held earlier this year in Napa that led to a recent commentary piece in Science. Other views have been published as well including Lanphier, et al. in Nature and I have put out there my own perspectives with a roadmap I call the ABCD plan. I followed up on the Napa meeting in today’s interview with Doudna and also touched on other important issues related to CRISPR-Cas9 technology. What specifically sparked the Napa meeting? Did you help to start the ball rolling? Doudna: The Napa meeting was organized by myself and my colleagues at the Innovative Genomics Initiative. We had ethical concerns regarding potential applications of genome editing because CRISPR-Cas9 is widely adapted and so simple. We felt it was important to convene a meeting of stakeholders. At that time did the organizers know about the rumors of papers potentially in review that might report genetic modification of human embryos? Doudna: I wasn’t aware of that work coming up, the possible papers in press on embryo editing. We knew, however, that that type of work was possible. We hoped that before it would appear in a publication we’d be able to pull together a consensus point of view through this meeting. We didn’t go in with a preconceived notion, but we felt that scientists should be discussing this, and it should be open and transparent. How did the meeting go? Were there some areas of disagreement? Doudna: It actually went fairly smoothly. There was definitely very animated discussion. This is a topic that people can feel emotion about. It is pretty profound if you talk about clinical applications that could change human evolution. There were different points of view, but not hugely different. I didn’t hear anybody at either extreme saying things like “We should edit people tomorrow!” or “We have to get rid of this technology.” It was more focused on questions such as “What kind of safety or regulatory matters should be discussed?” It was only a one-day meeting so there wasn’t a lot of time to get into other issues such as gene editing triggering a biological chain reaction where a dominant change could spread through a whole population. Will there be another Asilomar meeting like the one in the 1970s? Doudna: That’s the goal. We would like to convene a larger meeting. We want broad, international representation. That meeting will probably happen later this year. A number of groups have expressed interest. The aim would be to have representatives of the various stakeholders. Some of the top scientific advisory groups. Governmental groups. Funding agencies. George Church seems to have a more open view on application of this technology. Doudna: Any group of people will have a diversity of opinions. It’s the kind of topic that each of us comes to with our own set of beliefs and level of comfort with making changes to the DNA of an organism. That’s one of the reasons to get together. I found that Napa meeting to be extremely interesting and stimulating. George was not there in person, but he had a lot of input. I certainly learned a lot. Should there be a “pause” on clinical applications? How would that work? I don’t think I saw the word “pause” in the Science piece. Doudna: We decided not to use the word “moratorium” because some people view that as policing. How do you police it? That may be hard or impossible. Rather, we were suggesting that the community decide together about the technology. There’s this incredible potential to help, and yet also risks. It’s a great technology and we should be excited about it. It is incredibly enabling. It enables a lot of new biology that would have been otherwise difficult or impossible. At the same time, because it is powerful and straightforward, it means it also enables clinical and other applications that might be problematic. We, meaning the scientific community, have to proceed in a way that is considered. We can’t dictate what is happening in every part of the world. It would be presumptuous to ask for a moratorium worldwide. To be more realistic, we strongly encourage scientists to not use it for this clinical kind of purpose at this time. Let’s make sure we are doing the appropriate research before employing it in ways that could be harmful (or helpful for that matter). The recommendation is for a clinical pause. Research should proceed. Then this provides data to evaluate clinical potential and risks. Can you imagine a future point at which you’d support the use of gene editing in humans in a heritable manner? If so, how do we get to that point from where things are today? What do we need to learn first? Doudna: We need to learn how efficiently it works. What’s the best way to deliver it safely and efficiently? Not only efficiency, but also what are the off-target levels? How do we minimize that? What would be a safe level if any of off-targets? I’d like to see basic research like what happens to the DNA in germ cells or pre-germ cells when a double-stranded break occurs? What is the repair process like in those specific cells? Those answers would be interesting from a basic science perspective as well as informing future potential clinical applications. I feel uncomfortable imagining widespread gene editing use in humans now, but it is possible that there are going to be certain types of very specific applications that could be envisioned as beneficial in the future. I won’t be able to make a decision of the wisdom of such an approach until we have more data. What are the real risks? There is always a risk-versus-reward kind of consideration. In which cases is the risk worth the payoff? Can you comment on the recent Nature piece by Lanphier, et al. from ARM and Sangamo? Did you read that they are opposed to any germline editing, even in vitro? What do you think of their view? Doudna: They would not allow research. That’s one point of view. The challenge I see with that is first of all I don’t see how you would stop it. Secondly, even if everyone agrees with that, how do we move forward? If we don’t do the research, how do we make informed decisions on the potential for clinical use? If it is possible to permanently fix a genetic mutation that is responsible for a horrible disease, maybe there would be an argument; if we have the technology to fix it, maybe that’s a good thing to do. How do we know if we don’t do the research? To say that we are not going to do any research, it blocks the ability to inform. We have recently seen the papers on Staph aureus Cas9 that is smaller and the NHEJ inhibitor w/Cas9. What’s it been like to see this technological innovation from you and your team take off so dramatically? Doudna: It is an intense experience. It is very exciting. I was astounded this spring to wake up one morning with the realization that, “gosh just three years ago I hadn’t even written the paper yet.” Back then, three years ago, looking at the data we were thinking this was an incredibly exciting enzyme. The pace at which this technology is being employed is so fast, and there are many different ways to use it; these are aspects that have been so fun about it. It has real legs. There are many different flavors of Cas9 that occur naturally. That’s all just been wonderful. It’s a very special and unique experience. I doubt that it will ever happen again for me in my career. Work that started off as a very basic science project with our collaborator Emmanuelle and seeing how it turned into this incredible technology. What do we do if someone goes rogue? Doudna: That’s one of the purposes of these meetings: to get out in front of that. I can’t guarantee that that might not happen. I can work to form a coalition to say, “here’s our considered view of the technology and here’s what we see as a prudent way to move forward with this”. That’s really the best that we can do. There’s no way to unlearn what is learned. We can’t put this technology to bed. If a person has basic knowledge of molecular biology they can do it. It’s not realistic to think we can block it. Same thing with regulations. To imagine that we could have international regulations, it’s just not realistic, and in any case, how do you enforce them? I wouldn’t feel comfortable hiding away in the lab. The better path is to try to be open and transparent and to educate people who want to understand it. It’s such a wonderful technology in many ways. Like any technology it has the potential to be used for good and not so good. We want to put out there the information that people would need to make an informed decision, to encourage appropriate research and discourage forging ahead with clinical applications that could be dangerous or raise ethical issues. Do you anticipate that there will be papers this year on germline editing? Doudna: I’ve read that article in MIT Tech Review indicating that they might be coming. I wouldn’t be shocked if they got published this year. We need to forge ahead with open discussions. I don’t know how people will respond to such papers if they come out. It depends on what’s been done. Do you have any comments on the patent situation? Doudna: I think any time there’s a new technology there are going to be multiple claims around it. Especially something that’s very broadly enabling. That’s something that’s probably par for the course. What I would love to see as a scientist is to see people helped with this technology and to see society helped. I would like to see this employed to do that. I would hope that the IP situation doesn’t impede that. I’m just speaking as a scientist or person. Not as a lawyer or a UC professor. These IP matters are in the hands of very capable people who handle this kind of stuff. I have to let them do their job and just continue to do my job. Doudna: It’s really important for people to appreciate that this technology grew out of a project to figure out how a basic process in biology worked. Many discoveries are made via basic science and working to understand a process. You can do careful work and obtain data that allow you to deduce something fundamental about nature. That was very much the origin of this system here. That’s something great to emphasize. There’s a tendency now in our country and Europe to emphasize “translational research.” Maybe there is not as much of an appreciation of basic science as there should be. That kind of research was critical with Cas9. A lot of non-scientists don’t understand the process. Scientists are just curious about the world and we’ve chosen particular kinds of questions. We are doing it for the purpose of understanding our world and life.